Zondervan is the king of Bible options. Their NIV is offered in a variety of options. For avid readers, one of the fascinating elements of Bible printing is their two-column approach. 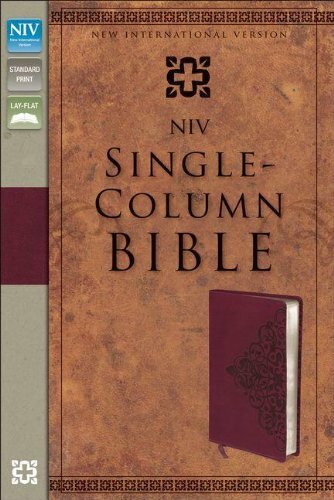 Single-column Bibles are gaining in popularity and the NIV Single-Column Bible (henceforth, SCB) is a good example as to why. The NIV translation itself is meant for extended reading. There is a novel-like element to its modern English. Similarly, the single-column formatting will appeal most to individuals who read regularly. The narrative portions of the text are rather blocky but they read more fluidly than the common two-column format. Here, the story elements of Scripture are in their comfort zone. This edition contains no cross-references, benefiting the cleanness of the pages. The “poetry” sections are formatted with the standard indentation and centering. This creates substantial white space in the SCB. The books of Psalms, Proverbs, Isaiah and Lamentations are full of this formatting. Throughout the SCB paragraph headings provide space for parallel account references. When used extensively (e.g. 1-2 Samuel, 1-2 Kings, the Gospels), this formatting breaks up the flow of the text. These parallel references are also provided in portions of the prophets, psalms, and epistles. While helpful, the formatting just seems to clutter and distract from the text. Physically, the single-column format adds to the width and height of the bible. It is much bigger than the bibles I usually carry. For comparison, the SCB is the size of a study bible but without any additional notes. For a bible that focuses on reader experience the weight is substantial and the font remains small. Still, the softcover edition fits well in my smallish hand and lies well on a table. A ribbon marker is provided to keep track of previous reading. Though brown is not my favorite color, the SCB‘s cover elicited multiple positive reactions from individuals as I showed it off. The Italian Duo-Tone is always a favorite. In conclusion, the softcover NIV Single-Column Bible is very reader friendly. Unlike “reader bibles” which remove verses and chapters for readability, the SCB also works well as a church bible and home study bible.